S2325 Clear Economy Dual Strap Clip. 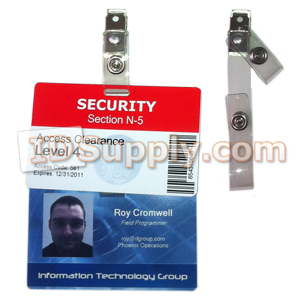 This Economy Strap Clip assembly holds two horizontal ID Cards or slotted badge holders. The clear vinyl straps utilize 3/8" diameter snaps. The short strap is 2-3/4" long. The long strap is 5-5/8" long. The strap spread is 2-1/8".